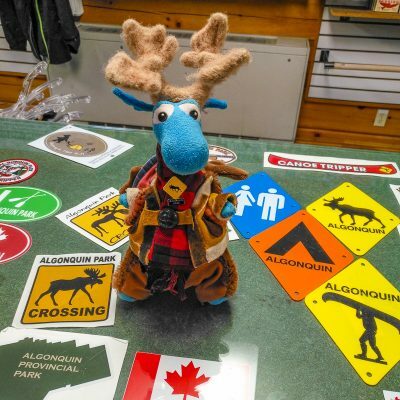 When you’re small and blue, and everything seems mountains high, well, partially because they are, you have to figure out different ways to have the experiences in Algonquin Park that you want. Poo has always had a great love for nature and wildlife, and well he has great enthusiasm about adventuring through the park, he is in a way slightly limited by his natural state. His little feet don’t carry him far, which makes trails rather hard for him. 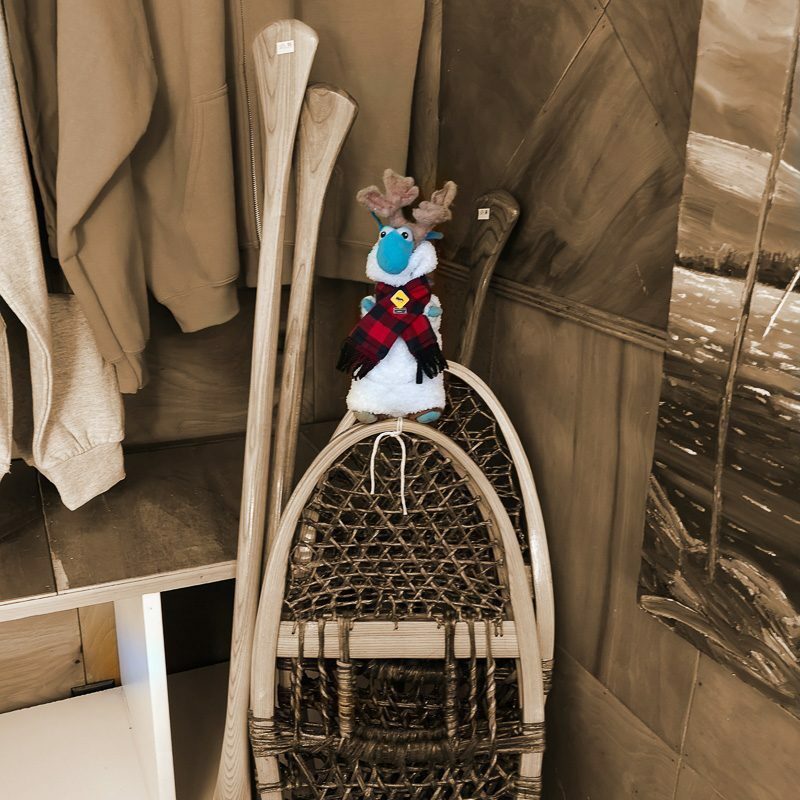 He also sometimes has trouble navigating big hills or obstacles, so he has to take a different approach to how he is going to go out and experience Algonquin. He loves the idea of portaging, but he can’t carry much, nor does he want to. He would rather be carried to locations that he likes and then have the time to relax and eat his favorite snack….bacon. But his aim when he is at the park is one thing, see animals……and pose for the occasional fan selfie. 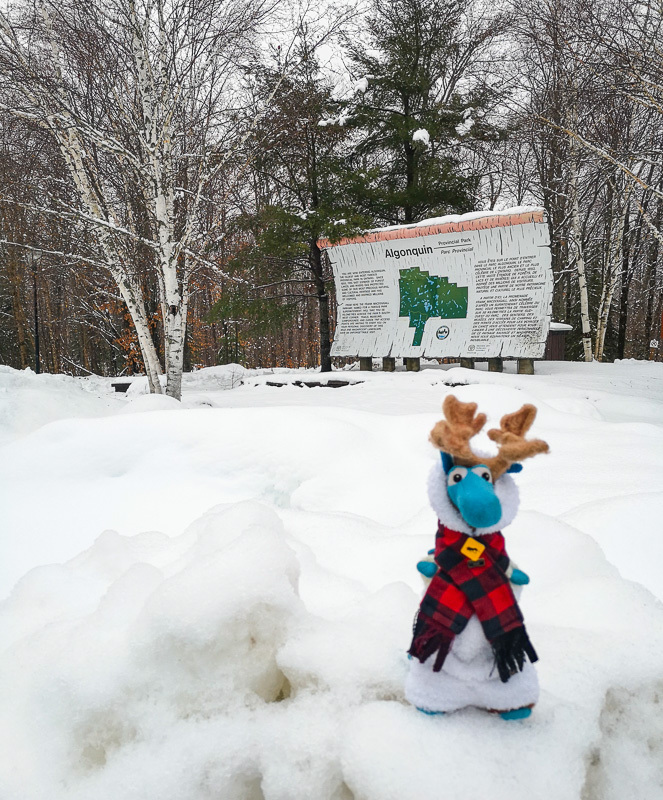 So Poo depends on some of the options available around the highway 60 corridor that give him plenty of opportunities to see all kinds of beautiful scenery and wildlife, to date Poo has never been to the park in over ten years and not seen his favorite animal….MOOSE! 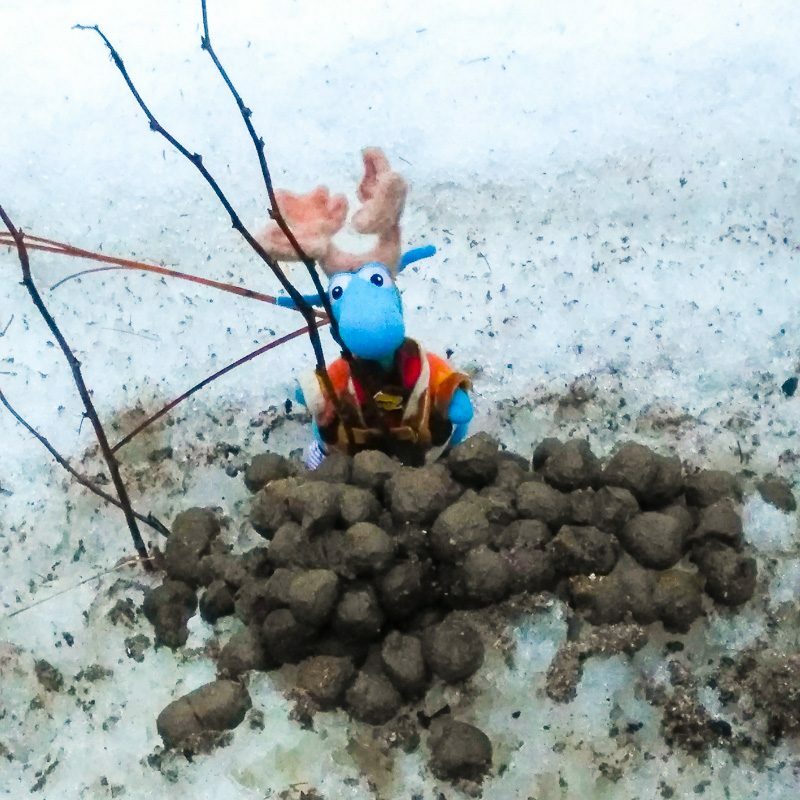 So how does Poo get around Algonquin Park? It’s all about accessibility, so he relies on the car. 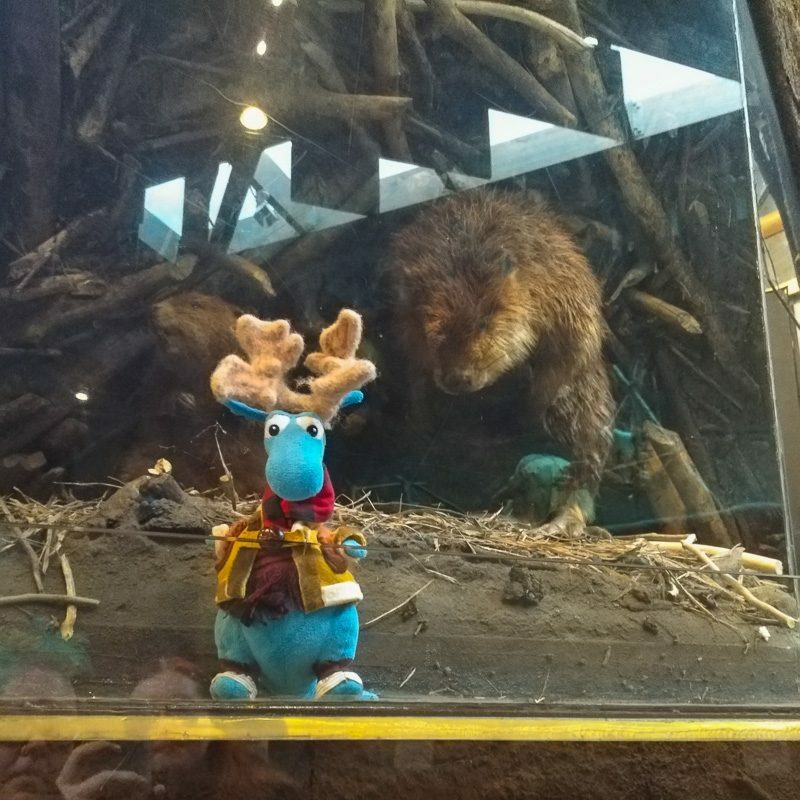 Poo wants to see some wildlife and maybe capture some memories. Poo recommends if you’re going to go and take photos, it is about using equipment you’re happy with. Well he likes the photos taken with the bigger DSLR camera; he does think it’s a little bulky for his delicate paws. So he uses his phone, which works for his needs. 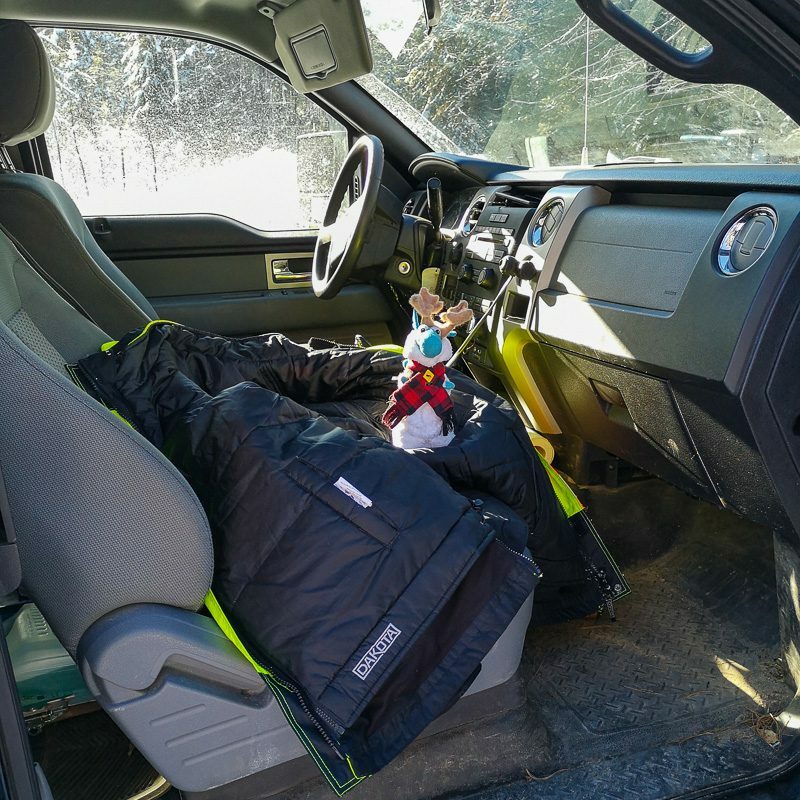 Poo’s day starts off with a good breakfast (donuts and bacon) and then he takes his position in the front seat on his pillow all ready to go adventure. 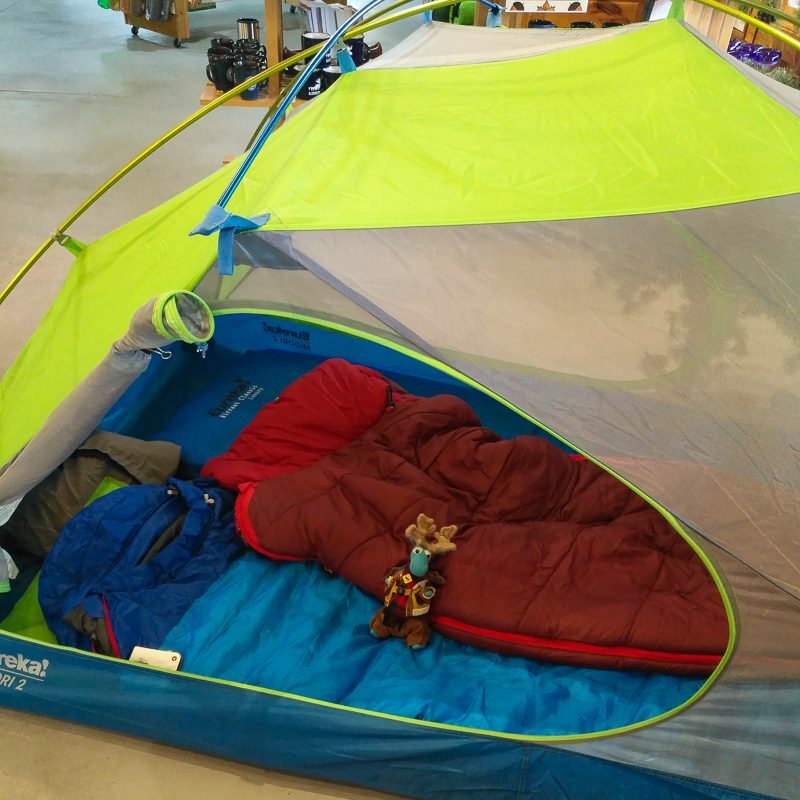 He sometimes stops into Algonquin Outfitters (See Map: 1, 2, or 3) on his way to the park or while he is in the park to check out all the great gear they have. His first stop is at the closest gate to check for sightings. 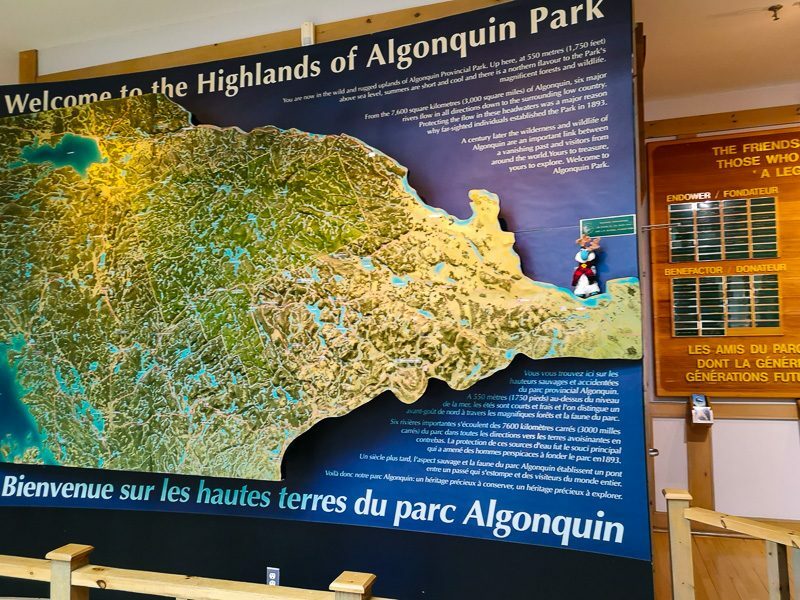 Poo stops at the west (4) and east gates (5), the Visitor Centre (6), the Logging Museum (7) and Algonquin Outfitters at Oxtongue Lake (1), Lake of Two Rivers (2), or Lake Opeongo (3) where there’s wildlife sighting board to get an idea of where people are seeing wildlife. 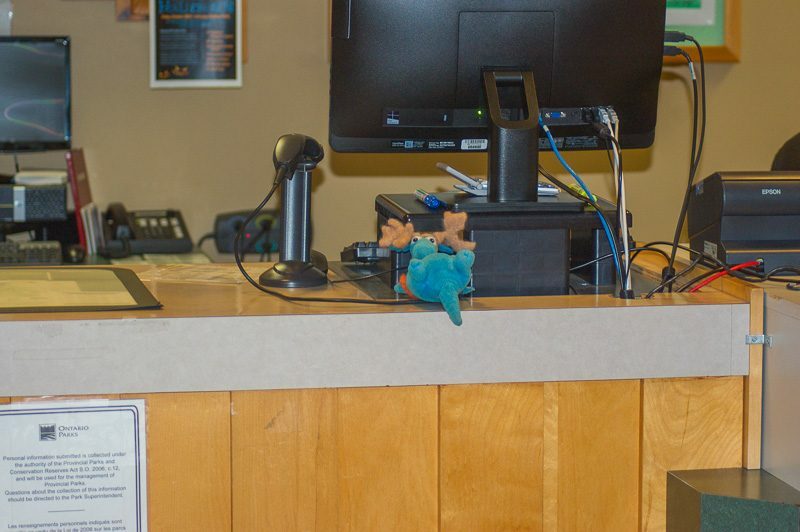 He also loves to have a chat with his fans and people visiting and working around the park to get an idea of what is a hot spot that particular season. Once he has gathered all his info, gotten some more snacks and finally made sure his blue Poo Flag is flying well on the car (he likes people to know that Poo is in the park) it is time to do the route. 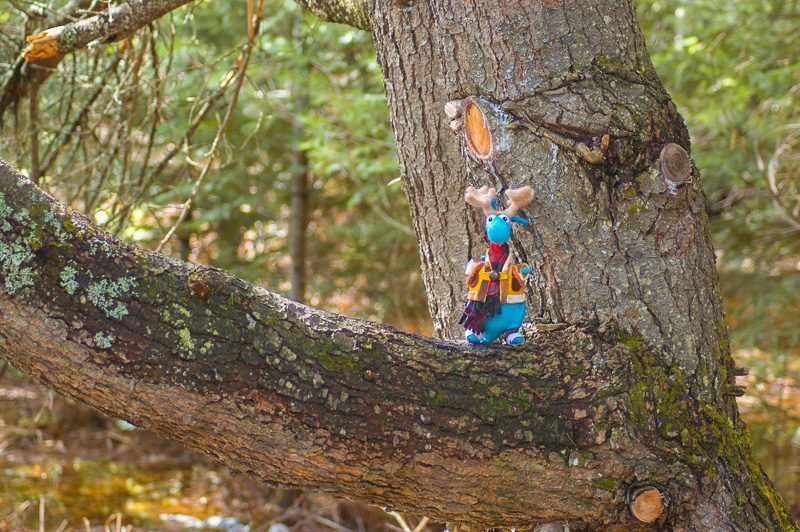 Some places in Algonquin Park are well-known places to possibly see your favorite wildlife. If you’re looking for Moose one of the best most reliable ways of doing this is to drive along highway #60 (8) keeping your eyes open to roadside Moose. Always beware of traffic coming behind you, not everyone is Moosing, Poo always safely pulls over to let people get by. Side roads can be a little calmer. Opeongo Road (9), Rock Lake Road (10), and Arrowhon Road (11) are all great roads to possibly see otter, beaver, bears, wolves, moose and many other animals or birds. These drives give him the chance to experience some beautiful scenery and not have to worry about tiring himself, or even worse…sweating. Poo appreciates accessibility designed for his particular limitations. Which also involve his pristine appearance never getting dirty. 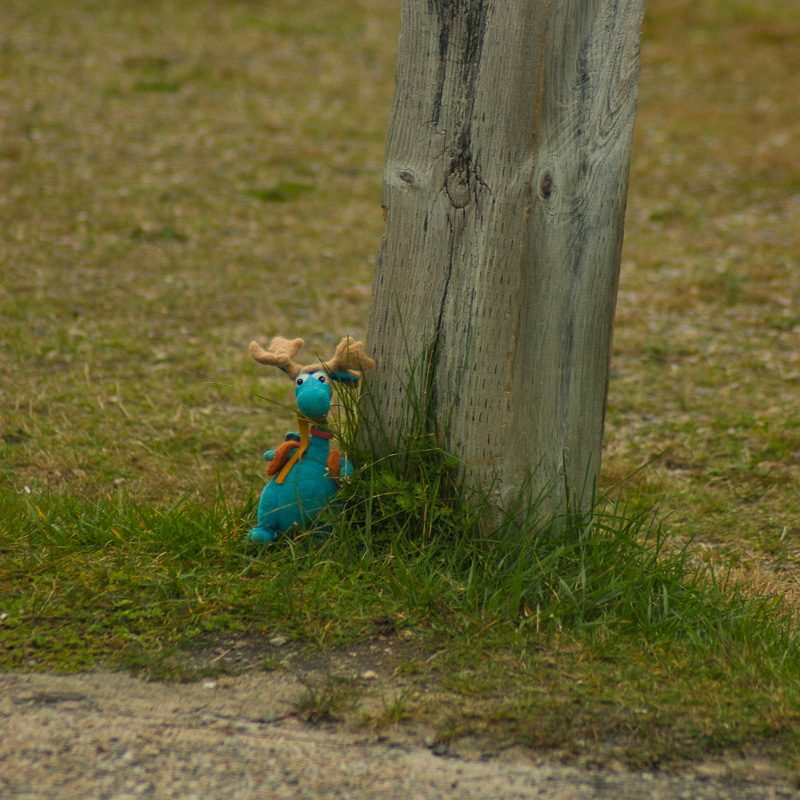 Other spots around the park have become famous for their regular sightings of certain wildlife. 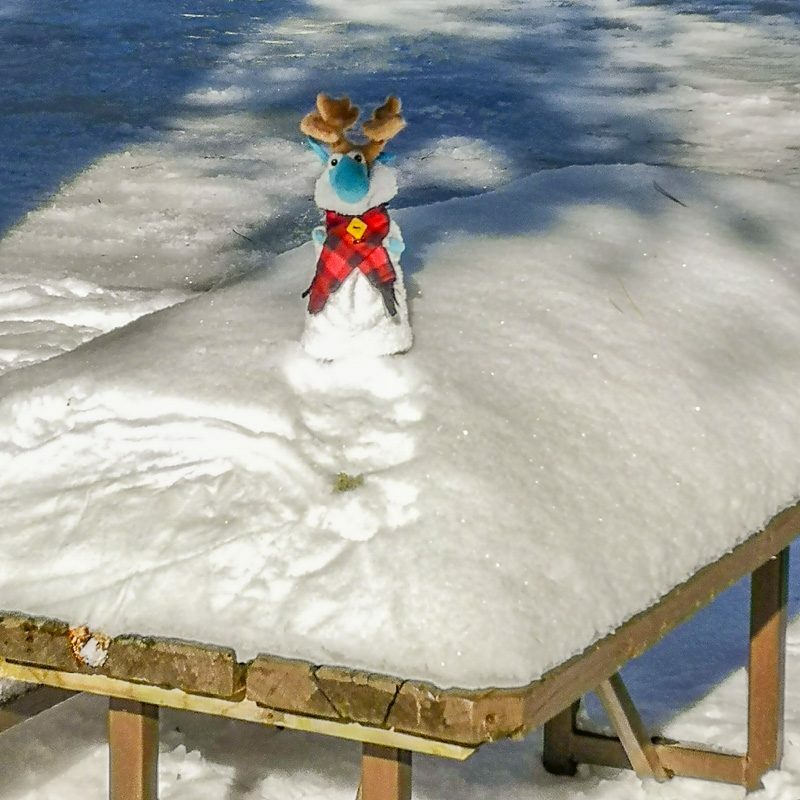 Sometimes these sightings depend on what season it is. 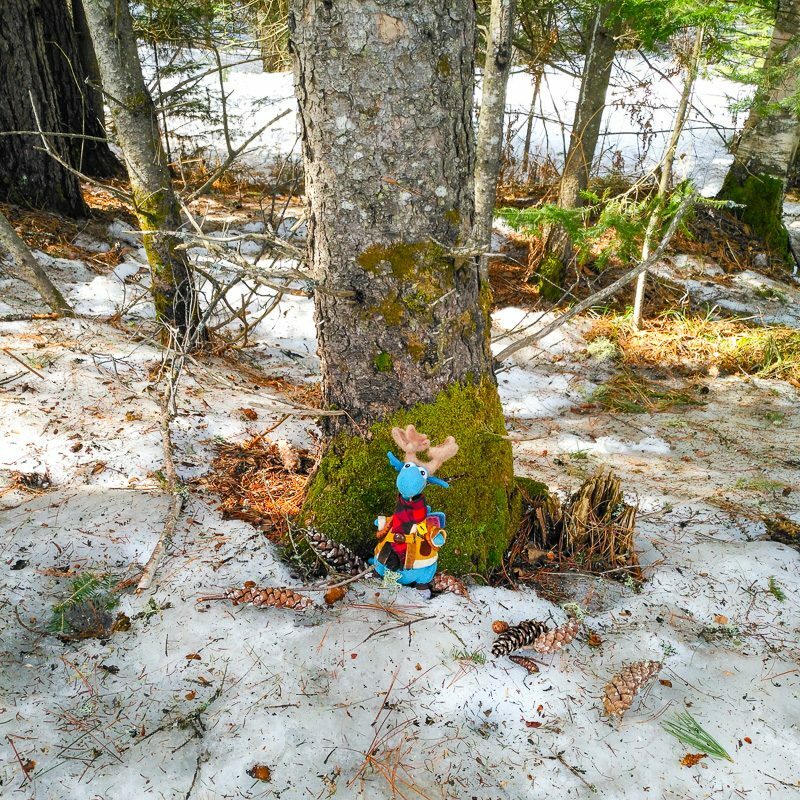 Mew Lake Campground (12) is well known for viewing bears during the blueberry season. The logging museum (7) is a relatively easy trail that offers a chance to sometimes see otters in the back pond. It also gives Poo a lovely old boat to climb on to get a good view of the area. If you spend some time camping in the park, especially in the winter, you will eventually discover the opportunistic and very skillful scavenging skills of the Pine Martens. 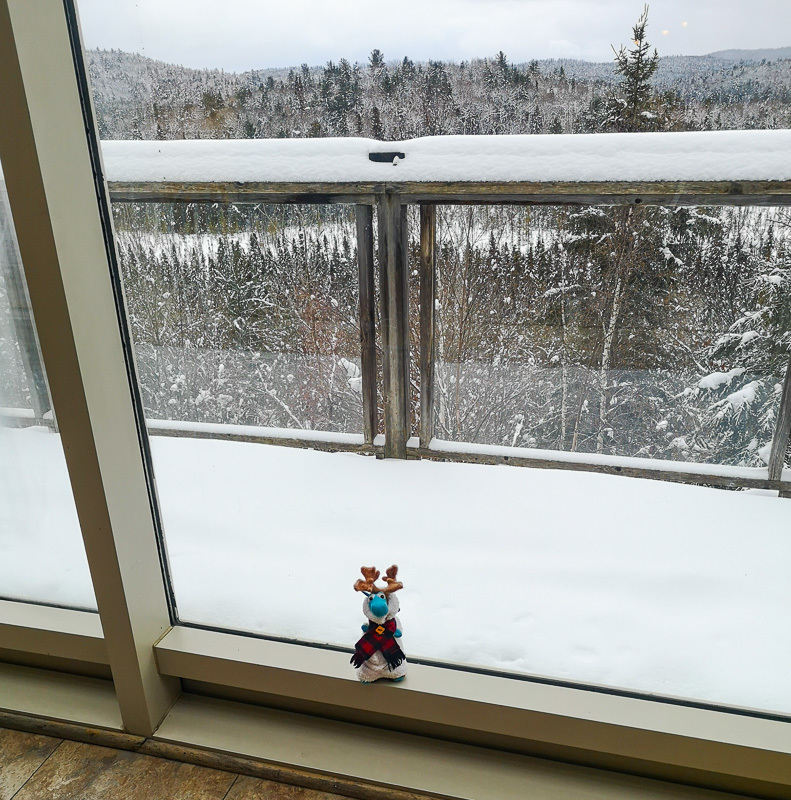 Poo loves to watch and photograph the martens that often hang around the recycling bins and cedars in Mew Lake (12) or to the left of the front of the visitor center (6). The front of the logging museum (7) is also a great spot. You may not be small and blue like Poo, but many people have different limitations that affect them in a similar way as Poo. 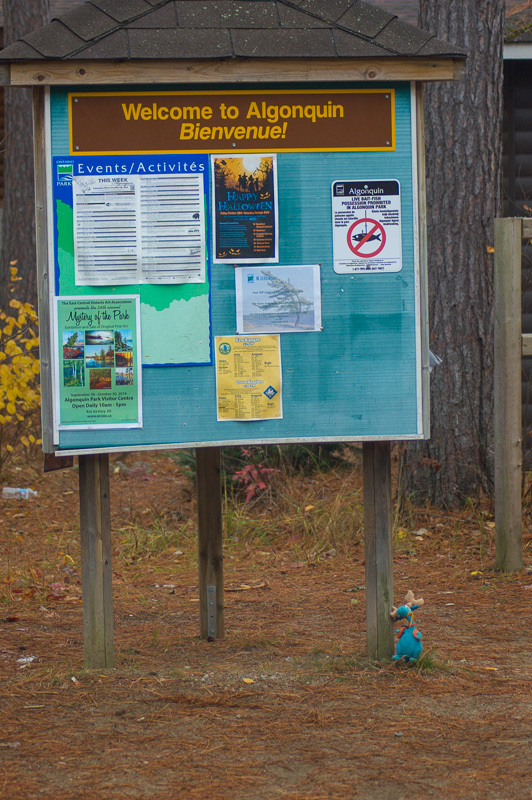 But it doesn’t mean it should limit your experience of Algonquin Park. 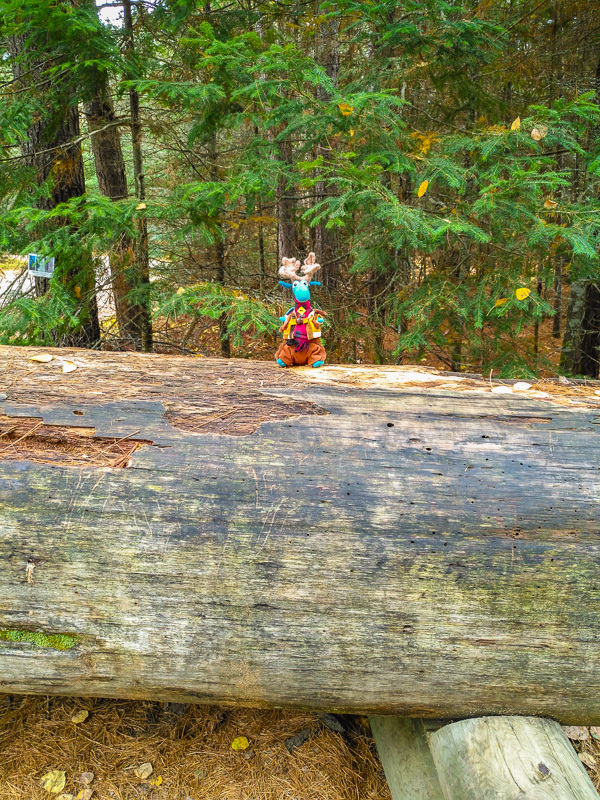 Poo loves seeing wildlife; he loves it almost as much as his love for bacon and donuts. 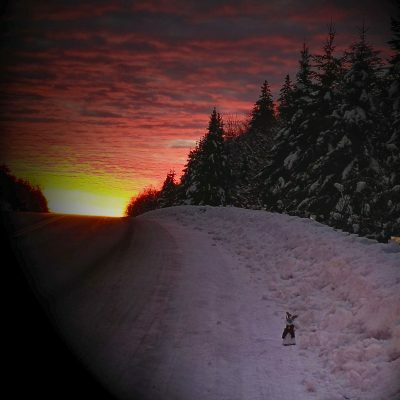 So he does spend most of his day following a route of driving back and forth along Highway #60 (8). 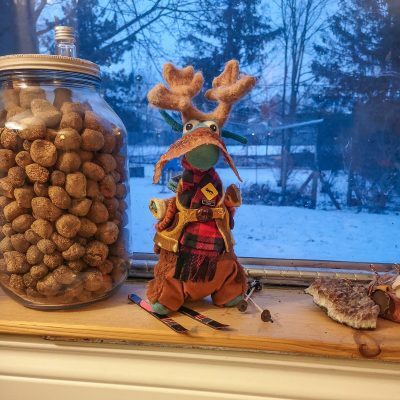 He likes a carload of snacks, some good music (ABBA) and the wind in his antlers. He is constantly excited by the potential that around any corner or over any hill something may all of a sudden appear, kind of like him! Poo believes that this section should naturally be about him. 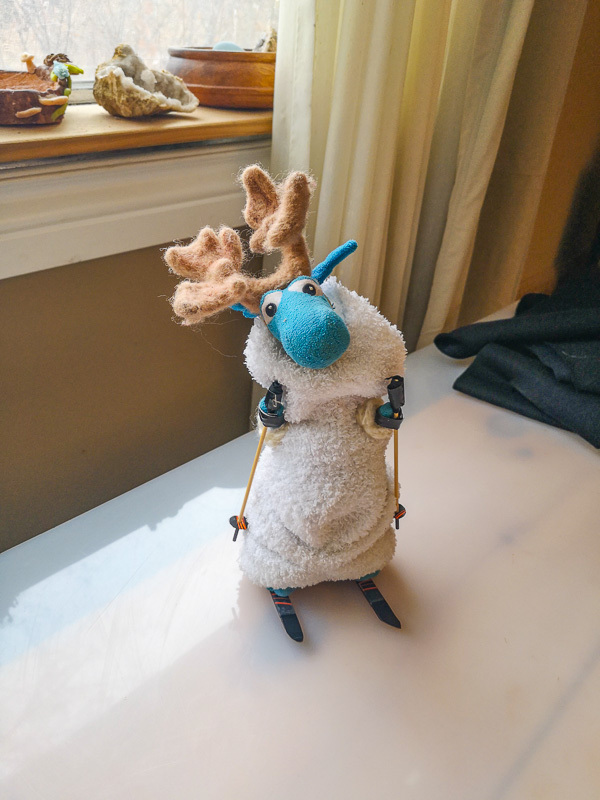 So Poo is a modest little blue dragon who feels his greatness is best described by a great set of majestic antlers, beautiful wardrobe because Poo loves good fashion. He loves good food and believes that candy and bacon can be a meal or at least worked into every meal. He also has a love for dancing and singing, and often will break into his own versions of his favorite ABBA songs, Dancing Poo, Voulez Poo, I poo, I poo, I Poo I Poo, and of course Waterpoo.